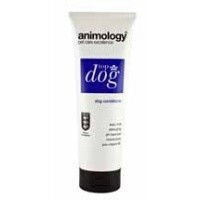 Animology Top Dog Conditioner 250ml is a top quality, vitamin enriched conditioner which will leave your dog's coat looking and feeling healthy and glossy. For best results, use this conditioner after washing your dog with Animology shampoo. A tiny amount of this conditioner goes a long way and whether your dog's coat is long or short, Animology Top Dog conditioner is sure to leave it looking its best!